I was all in a dither yesterday because 750 words went on the blink. I kept pushing “force save” and cursing and gnashing my teeth and getting up from the chair, then sitting down again, checking every 2 minutes to see if the site had saved my words. I was freaking because my streak of 95 days was in jeopardy. 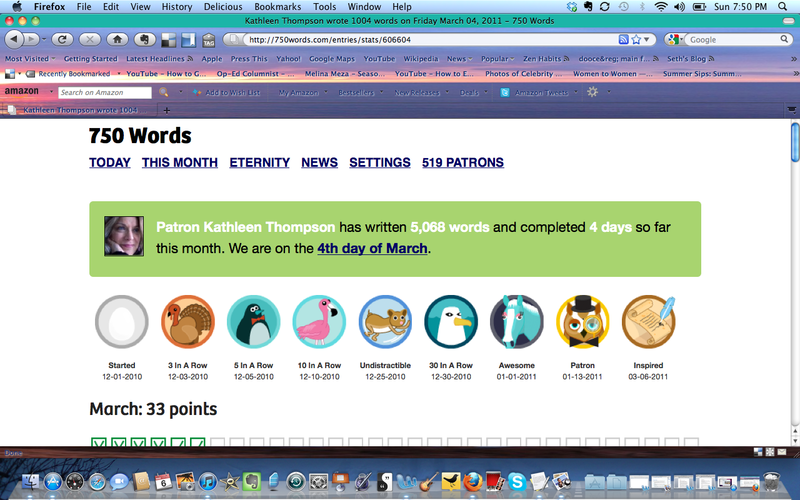 The site refused to save any of my words after 748, and if you don’t get to 750 words, your day doesn’t count. Thing is, I am ridiculously and shamelessly motivated by these stupid badges. Stickers, badges, stars on spelling tests, trophies, plastic Beethoven statuettes–you name it, if there is a little prize to be had, no matter how cheesy, worthless and meaningless, I will go after it, doggedly. So, yesterday, after sitting all morning fretting about my lost Phoenix badge, I finally gave up trying to make the computer do the right thing, and drove to Wegmans for my weekly food shopping. On the drive I pondered long and hard this fixation with doodads. Didn’t I subscribe (at least in theory) to the Zen concept of “detachment from outcomes” and to doing a thing “for its own sake”? Isn’t this a central tenant of the Bhagavad Gita, of Pantajali’s Yoga Sutras, of every wisdom tradition known to man? So what if my words didn’t “count”? I wrote them. I know the streak is intact. I know I did the work every day. I know I am becoming a better writer as a result of daily practice, as a result of the site. What do I care if the site stutters? What do I care if there is an algorithmic tic that stops counting at 748 words? I wrote over 900 words that day. That’s all that matters. When I got home I sat down and wrote a note of thanks to the creator of the site, Buster Benson. He does this site for nothing. Doesn’t charge a penny. And most of the time, the system works flawlessly. On the site’s status page it says that Buster knows about the glitch and is trying to fix it and will make it right with anyone who’s streak got messed up. Aww… What a guy. But even if he can’t fix it, and my “streak” comes to an end, I’ll be there tomorrow morning, writing my words. I’ll just rename the site 748 words and…problem solved! As for the badges? Eh. I don’t need them anymore. They’re cute and all, but they’re not real. They’re just little pictures on a screen. But my words–ahhhh, those represent my thoughts, my inner landscape, the workings of my mind. And to get into the habit of visiting that country daily, and create relationships with those inhabitants, now that’s the whole point of 750 words.